THE SERAB RUG - The designs of Serabi rugs are woven with an exceptionally durable, tight Turkish knot. Serabi is a particularly distinguished sub-category of the famous Heriz style of Persian carpets. It was particularly favored by European and American markets of the late 19th and early 20th centuries, and the high-end market influence of the west can clearly be seen in their exceptional bold coloring and refined design. The distinction between the broader category Heriz, and the narrower designation Serab can be somewhat confusing, even controversial, as it hinges almost entirely on the subjective quality of design; still, among experts it is traditionally accepted that Serabi denotes those exceptionally artful, balanced examples of the Heriz rug, found predominantly in the eponymous region of Serab. The Northwestern city of Serab is beautifully situated in a verdant swath of present day Azerbaijan province, Iran. Located between the Bozquosh mountains in the east and the stunning peak of Mount Sabalan in the west, the low green hills of Serab appear almost Celtic, with wide, idyllic pastures rising into hills, and fields maintained by shepherds who provide the town with its exceptional local wool. The mountains are, in fact, ancient volcanoes, dormant, but fed by an interior energy that provides Serab with a network of storied springs and spa waters. The region remains a place of pilgrimage to this day, historic and full of beauty. The settlement itself is only part of the story, as Serab also sits directly on ancient travel roads of Persia’s nomadic tribes. One of Azerbaijan’s oldest cities, Serab originally functioned as a kind of oasis that for centuries absorbed the multitudes of tribal cultures passing through its gates. As a consequence, Serab has benefited from the kind of diverse cultural roots—and richly disparate weaving traditions—more typically seen in the larger trading and cultural centers of Persia. From the tribal cultures that have historically passed through its borders, and from its history as a settled and ancient city of Persian weaving, Serab derives the heart of its fame: design. 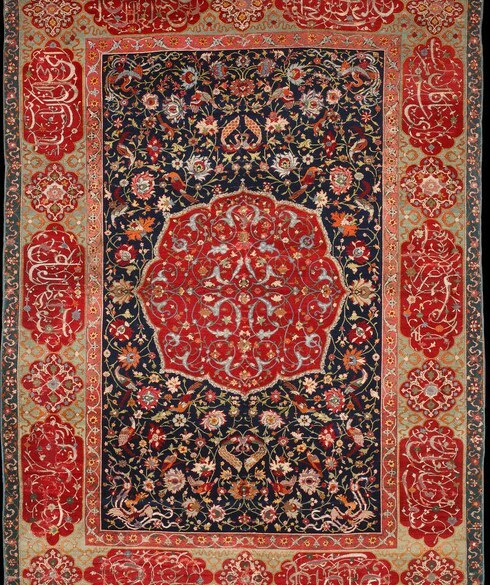 In the uniquely angular, marvelously distilled patterns of Serabi carpets, we see clear tribal influence refined by city workshop expertise: numerous rural motifs coalesce, and combined with the classical designs of the city workshops, Serabis emerge as unique, remarkably refined carpets that fall somewhere between typical Persian village and city rugs. In particular, the Serabis are distinguished by their expert execution of Heriz geometric motifs—bolder, sharper, and less curvilinear than their standard counterparts. The designs of Serabi rugs are woven with an exceptionally durable, tight Turkish knot, with anywhere from a relatively coarse 40 to a relatively fine 120 knots per square inch of pile. 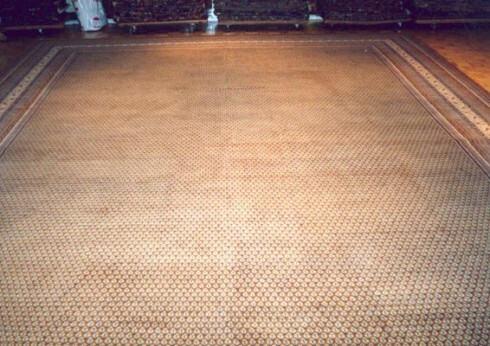 It is important to note that when it comes to quality, more knots per square inch does not necessarily mean better, and with antique Serabis this is particularly true. Many of the finest examples of the form, woven by individual weavers or by families, fall somewhere toward the coarser end of the spectrum. Across the board, whatever their fineness of pile, these are tough rugs, woven on thick cotton warps. 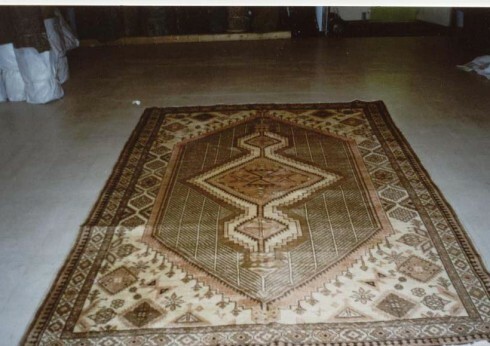 Interestingly, many Serabi rugs are found in elongated shapes. Some are runners, but even those that are carpet-sized are exceptionally long for the form. The simple explanation is this: Serabis have always been incredibly popular in the local, as well as the international market. 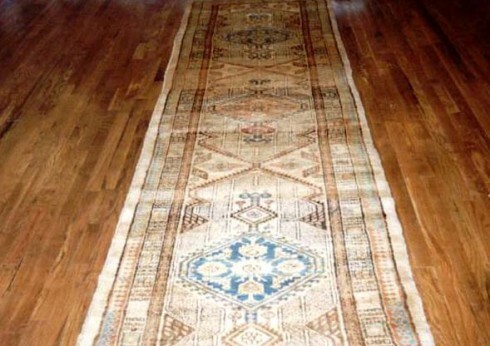 The longer rugs are a sure sign they were originally produced for use in city homes in the east, before they became highly-valued antiques in the west.